We set off on another long (five hour) ride with Ashok from Agra to Jaipur yesterday morning, with a couple of scheduled stops: Fatehpur Sikri and The Monkey Temple just outside of Jaipur. These drives are almost indescribably surreal, and it’s hard to overstate the eye-popping sights on Indian roads. For example, we saw a lady get run over. She seemed disoriented in her sky blue and gold sari, but someone was helping her up when we passed, and she looked okay. BTW, I have to post something later about the saris. They are collectively beyond gorgeous, and I don’t think I’ve seen the same one twice. More often than not, their wearers can be found riding side-saddle on the backs of of mopeds or motorcycles, sometimes while clutching an infant or toddler…or three. Now that we’ve left Delhi, there are also cows on the roads aplenty, along with dogs–all strays, all remarkably chill–and the occasional donkey, sheep, pig, and yes, monkey. Stop one was Fatehpur Sikri, the first palace complex of the third Mughal Emperor, Akbar. It seems that, while he himself was Muslim, he was very liberal and had three wives of three different faiths: one Muslim, one Hindu, and one Catholic. His impressive palace fort reflects his easygoing, tolerant nature, boasting a separate mini palace for each wife, each embellished with the symbols of her religion. The Hindu wife though, had the biggest palace since she was the mother of his only legitimate son. His utter devotion to these wives however didn’t prevent him from keeping a harem of 300 concubines, faithfully guarded by a regiment of eunuchs. The visit to this palace complex was fascinating and going pretty well until we crossed over into the neighboring, still active mosque Akbar erected on the same site. Then things went sour fast. Incredibly aggressive touts of all ages started shoving cheap trinkets, toys, souvenirs, and jewelry at us, each invoking the American holy trinity of “Obama, Michael Jackson, Michael Jordan.” The guide himself sold us some “tradition” about paying for a cloth and some thread, entering the holy man’s tomb, making a wish, and tying the thread to the openings in a marble screen. We immediately smelled a rat but then we were told that the cloths were donated to poor women and girls. We paid 300rs for the cloth (the “donation” request had begun at 1300) and I entered the mosque to make my so-called wish. Needless to say, I was hassled (unsuccessfully) for more money on my way out. Disgusting. If this wasn’t bad enough, there were the children. A tiny and tenacious angel-faced one named Ahmed tried to sell me a set of beaded pens from the time I got there to the time I left. While I was sorely tempted to give him more, a smile and conversation is all he got from me. Anyone who’s seen Slumdog Millionaire knows that these kids are being victimized and abused, often by their own parents. He pulled at my heart strings, but I wanted no part of that. In chatting with him I found he was eight, had two siblings in the same line of work, and knew how to butter up tourists in Spanish, German, and French in addition to English. That place so far was the most depressing part of our trip. The next stop was The Monkey Temple on the border of Agra and Jaipur. Monkeys seriously give me the heebie-jeebies, so agreeing to stop at this place at Ashok’s suggestion was very intrepid on my part. We were met at the gates by Rohit, yet another guide, paid a small camera fee, bought some peanuts, and went off to find some monkeys. Along the way, Rohit gave me feeding lessons and tried to convince me to let one sit on my shoulder. That was NOT gonna happen. T. was worse though; the only thing he was determined to feed was the memory card on our camera. Things were okay for a while, as the mostly female monkeys and their babies gathered rather politely for their nuts. Then, what I can only assume to be the baby daddy of the entire harem showed up, grabbed me by the fringe on my scarf (although not ungently) and decided to plant himself at my feet so he could hog the rest of the nuts. After awhile, Rohit sent off with a swift kick, which was the only way he was going to let me go. I couldn’t help but make connections between this episode to my earlier ones at the palace and mosque. You seriously cannot make this stuff up, but that’s how India is. A remarkably dignified pair of our monkey friends at The Monkey Temple just outside of Jaipur. Apparently, you have to come at night for the leopards…Uh, no thanks. Mommy and baby pairs like this one were pretty polite and well-behaved. Daddy monkey was a little more aggressive. The head tie was my attempt to ward off the scorching sun, with limited success. Greeting a very serene cow outside the temple gates. 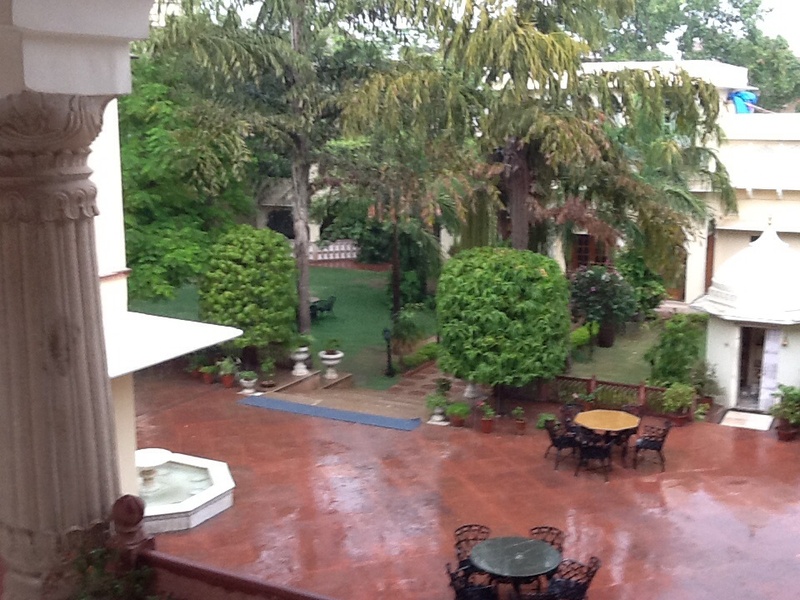 We’re now in Jaipur at Alsisar Haveli, the first of our three heritage/haveli hotels. 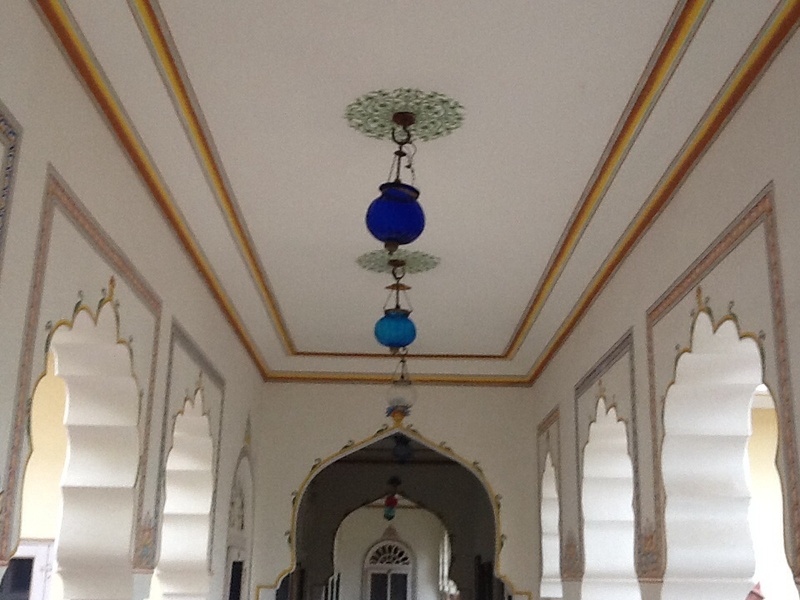 Havelis are colonial era or old maharajah mansions that have been converted into hotels. It’s beautiful here, very much like the hotel featured in the movie, Exotic Marigold Hotel, and a far cry from the chaos just outside the gates. More on that next. Visiting in low season resulted in rather exclusive dining in Alsisar Haveli’s stunning dining hall. I doubt you’ll have any experiences quite like that in the near future. In Bali ,there was a place called Monkey Forest.I walked in and within the first 10 minutes ,there were Makak monkeys EVERYWHERE grabbing anything they could.If you aren’t wearing a football helmet your braids will be pulled on and your hat is gone. Within 5 minutes I was gone. Out of control Monkeys are a trip! The contrast between the glorious and the depressive conditions just are staggering!